Due to the Julian Calendar the Ukrainian Lutheran Church begins to celebrate Christmas on January 6. To those of you who begin to celebrate our Savior's birthday today - Merry Christmas and a Happy New Year! May the Lord Incarnate continue to gather you around the Cradle of the Church - His Word and Sacraments! We have very snowy and frosty winter (I think they call it 'global warming'). It means that in many parts of our country some roads are totally closed and some are very difficult to drive on because of snowdrifts. There have been a few days of rather calm weather in a row but today it is snowing again. Since our pastors believe they should deliver food of the Holy Gospel to their sheep every Lord's Day despite of any weather conditions, could you pray about their safe travels in Ukraine tomorrow, please? 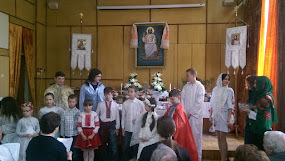 A picture is from our pastor from Malyn and Radomyshl, Rev. Dmytro Didkivskiy. He wrote if not police patroling the area he and a dozen of other drivers would have to spend a day or so in snowdrifts and on a road with fallen trees. Thank you for your prayers and have a blessed day of the Lord tomorrow!